Charities are increasingly looking to corporate partnerships to help them with problem-solving and are investing more money in the arrangements than in previous years, new research shows. A survey of 126 charity and corporate partnerships published by the business consultancy C&E Advisory found that although most companies – 92 per cent of those surveyed – entered into partnerships to boost their reputation and credibility, charities tended to be motivated by the opportunity to access funds, with 93 per cent citing this as their main driver. Both charities and companies were now more prepared to invest heavily in the partnership, the survey found, with 31 per cent of organisations surveyed investing resources of more than £10m a year in such schemes, up from 22 per cent last year. The number of organisations that would characterise their partnerships as "deeper, problem-solving partnerships designed to address core, mission-relevant or purpose-led issues in ways that create value for society, for ourselves and for our partners" has leapt up to 42 per cent of respondents, from 24 per cent in last year’s survey. 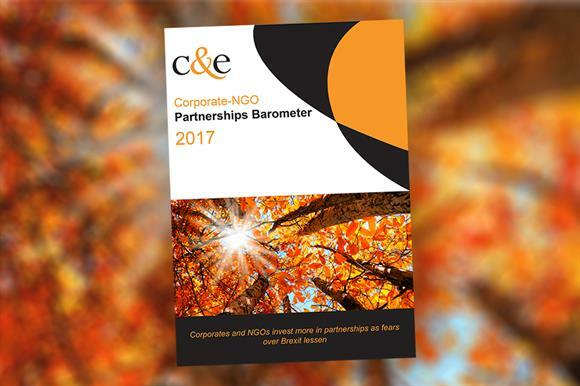 More than three-quarters (79 per cent) of corporates described their partnerships as strategic, compared with 32 per cent of NGOs. Researchers found that charities were increasingly looking to partnerships to help them with innovation and human resources development, and to increase their efficiency and effectiveness. The survey also found that more organisations than before believed they were able to participate in corporate partnerships. The report says: "In our concluding remarks for the Corporate-NGO Partnerships Barometer 2016, we observed a worrying disparity between the proportion of NGOs (over a third, at 36 per cent) and corporates (16 per cent) whose organisations were deemed to be lacking a sufficiently enabling environment to sustain deep, problem-solving partnerships, or did not value such partnerships." Last year’s report expressed concern that the high proportion of NGOs affected could create "a bottle-neck" in terms of partnerships. This year’s survey found that although many charities still had concerns about their ability and organisational attitude to partnerships, this proportion had fallen to 23 per cent. "This is a very material and encouraging change in a single year, and bodes well for the future of cross-sector partnering," the report says. Manny Amadi, chief executive of C&E, said the survey "paints a highly encouraging picture of the cross-sector partnering landscape." He said: "Leading companies and NGOs are clearly prioritising and investing greater resources of funds, time and know-how into deeper, problem-solving partnerships with each other in which they draw on their assets."